Though the build of this knife was the same as the other Klotzli’s I have owned, this one seemed a bit more studry, and smooth than the others. I’m not sure why, perhaps it was jsut oiled better, and slightly better put together, but it had a sturdiness to it. Like most Klotli’s, it has a partially serrated blade. This model came with a genuine leather pocket sheath, but also has a pocket clip. Very nice crisply ground blade with the signature large pivot which adds a unique style to the knife. Open back design with spacers rather than a backspacer for a lightweight knife, though it would be a bit more gentsy to have a full or partial backspacer at least. 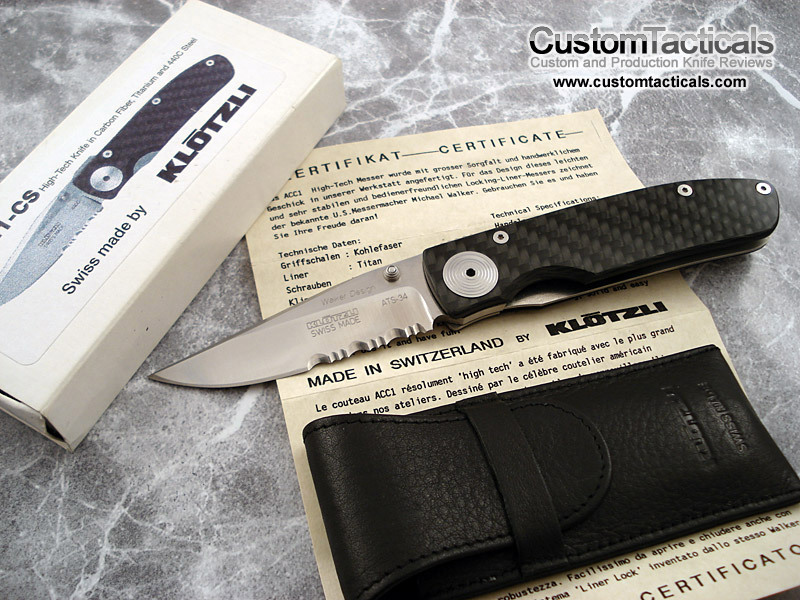 Another common element the knife shares with other Klotzli’s is the single liner. There is only one Titanium liner on the side with the liner lock, while the other side is Carbon fiber and sits flush against the blade. Probably not the most ruggest design, but it is rigid enough that there isn’t any real noticeable torque under normal conditions. 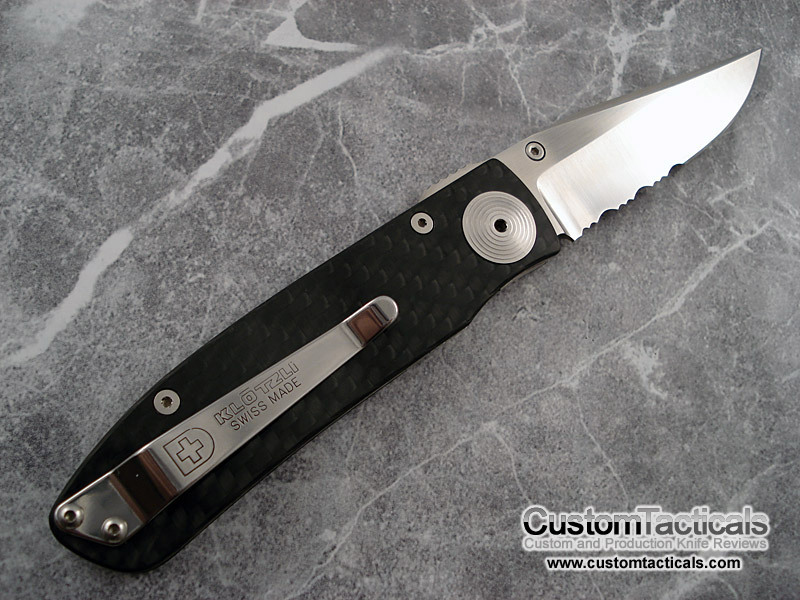 Blade steel is a very reliable ATS-34 Steel, with very beautiful Carbon Fiber scales, titanium linder and a steel pocket clip and hardware. 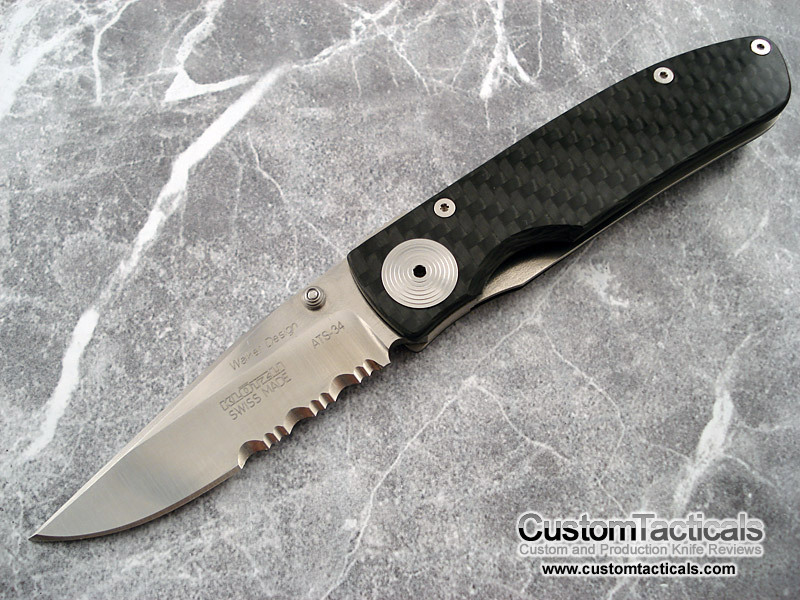 Blade is a clip point Michael walker designed affair with partial serrations and a satin finish. Single thumbstud allows for one handed opening. Suprisingly for such a thin knife, the hollow ground blade is fairly thick and the edge isn’t as thin as I would have liked it to be. Overall its a nice gentsy knife with a high-tech look that works well. For the price it is a really well made knife with excellent finishing, probably better than most in that price range. As I broke the tip of my knife…I am looking for a replacement blade for my Klotzli Walker ACC1 Classic. I have searched online and come up with nothing. Would you have any idea which way to direct me? Have you tried contacting Klotzli directly? I don’t think anyone else besides Klotzli would have a replacement blade for their knives.